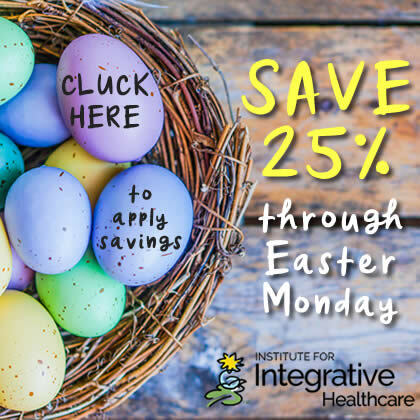 This is probably one of the best courses I have taking from Integrative Healthcare Studies. After taking the course I have made changes to the way I meet and interact with clients in my business. Everyone who is a therapist (or in any business) should read this book. Wonderfully put together text! It held my interest and I liked the stories/examples that were in each section. By reading the examples/stories I could understand more clearly how the lessons would be used in situations. The text really helped me to see how having a good understanding of ethics and utilizing the lessons would benefit my clients & my practice. I honestly didn't want to take this course. I had to in order to fulfill the NCBTMB ethics requirement. However, I found the course to be very helpful and educational. I would recommend the reading to any massage professional. I am especially grateful for the straightforward and easy manner in which I was able to navigate the course online. The Educated Heart is a clearly written, highly readable book which helped me to fully understand the importance of boundaries in massage work, and how to create and maintain them. I have gained a great deal of insight from this course and will refer to the book often. I feel stronger and more confidant with my work going forward. The textbook was very well put together and brought up many situations and issues that might be faced. It was helpful to think about handling these situations if they should arise. I have actually been through some of them and think I would be better able to appropriately handle them since taking this course.Will keep this book close at hand! This course made studying ethics a delight rather than a chore. I loved and very much appreciated "The Educated Heart". I will tell friends who are therapists or bodyworkers about it! It's a great CE course. I have taken other professional courses on ethics, and never found anyone so interesting as this one. In the past I would skim through to find the answers but this time I found myself reading the whole book 1st and then going back for the answers. I want my other colleagues to read it also. Thank you. "The Educated Heart" is one of the best books to refer to about ethics. You are my "go to" for online courses. Appreciate that the material is updated and changes with current conditions, so it's not the same ethics course over and over. I will print out the text and refer to in when supervising student bodyworkers. Thank you! This is always a good refresher on how to handle different situations that may come up in the office. This was my first online class with the Institute and I plan on taking more. It was clear, concise and up to date on what is happening in the day to day activities in the workplace, which gave them great examples to use in the text book. It also, made me think more about how I have been handling myself with my own clients in my own practice. I have some areas to improve upon thanks to this class I feel very confident that I will be able to do it as I have the text book to refer back to when I need to. Thank you again for such a great experience. This course was amazing!! I recommend every therapist read and own this book. 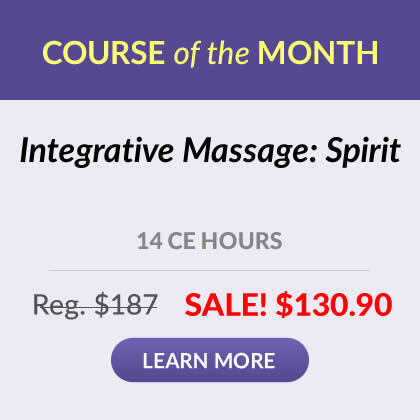 I wish I had this course 18 years ago when I was in massage school. I will read this book again. Thank you! This is the best online course I've seen. It's not the only online course on ethics and boundaries I've taken, but it's by far the best. I wish all massage schools had a copy of your book! This course was my favorite of all the ethics classes I have taken so far. The material was engaging and thought-provoking. WONDERFUL class. Love this book it had lots of information. This has helped me a lot about Ethics: Professional Boundaries. Just get the book to read, you will learn a lot. This was a very interesting and informative course on ethics. I learned a lot and will be able to relate better to my clients in certain spa situations. One of the best Ethic courses that I had, and which I would not just recommend to bodyworkers but to clients too! I highly recommend this course to new practitioners as well as seasoned therapists. This book covered so many avenues regarding ethics. I wish I had this book upon graduation! It is one of those things you look back on and can definitely reflect on many experiences with this new knowledge. The book was informative and comprehensive. Great refresher. Would definitely take again. This was the best ethics course I have ever taken. I have been in private practice for more than 10 years and I have had to face so many of the situations discussed in this book. I am recommending it to all of the massage therapists that I know. The information in this course has given my the knowledge to proceed with my career with confidence. This was extremely helpful to me, and I feel it is already making my practice easier to utilize and be aware of appropriate boundaries. This course was a good refresher. I will be using some of the suggestions given in the book “The Educated Heart”. Thanks! I had low expectations of having to take another ethics course but found this one to not only be informative but interesting. I read this book in school almost 5 years ago and didn\'t really find it very interesting but now working as a massage therapist it really made me look at how I was working with clients and makes me think about how I am interacting with my patients and how my boundaries are with them! loved it.. i was refreshed on things i learned 4 years ago in school thank you. I read this book before,but have been re-reading and have found myself looking at current situations with a bit more clarity. What a great reference, and manual!! In-depth and informative. Prepares you for any situation which may arise in your pracdtice. Due to this course, i will be making some changes in policy and having it written. this course made me think alot about how to handle different situations. I gained so much personal insight. Lots of great real-life, real-practice information in this course. I will definitely be able to use this book as a reference in the future. Also good advice on money, trades, and those tricky dual-relationships! This was a great course. I wasn't looking forward to an ethics class, but was pleasantly surprised. The text is wonderful and I've been recommending it to people. Thank you! Excellent course and the manual will be a valuable resource for reference. I enjoyed refreshing on my Ethics and boundaries as well as learned some good information to add into my practice. Thank you!!! The information is extremely valuble for my profession. The website and exam are very straight forward. I would definitely use this site again for an online course! I like the ease of this course and was able to complete it at home and in office. It made my life very easy. Thank you! Valuable information & interesting reading. Great course. Kept my interest and gave me good insight. Even as a long time therapist thinking I knew everything when it came to boundaries, this class was very informative and helped me to remember some of the things I may have forgotten over the years. A good all-inclusive ethics course. The information contained in this class are very informative as well as very understandable. Loved the course! Went into this feeling I didn't need to know this stuff. Surprise, I found much info that I had not been taught in school. This helps so I can understand clients more. Thanks. It was very helpful and refreshed information I received during my initial schooling. Valuable information and a very good read. Great course. The book is extremely well written and helpful, and a wonderful resource to keep as a reference. This is the best ethics course I have ever taken. The text was brilliant, well written, and very helpful. Great course. To the point. This was a straight forward course that was helpful in refreshing my knowledge of ethics and boundaries. 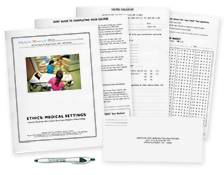 The course is clear, concise, and covers a wide variety of ethical issues. I enjoyed how the booked gave great examples. The book was so informative and positive about the subject being presented. It was very informative, it taught me many things I did not know. 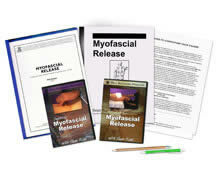 Important boudaries for massage therapist to establish in their practice are clearily layed out in this course. If you are unsure of anything ethically speaking about your massage or any kind of therapeutic practice, read this book and it will explain the difference between right and wrong. Thorough and easy to read with up to date information. I think it was clear, informative and interesting enough for those of us that have been doing this for awhile. A must have course for all body workers. This will change how I practice and has given me more maturity as a Massage Therapist. Well structured and interesting material. I learned a lot of valuable information from this course. Thank you. I enjoy all the courses I've taken from Health Positive. Your courses are professional and very thorough. Excellent book/course. Although I've been in practice for almost twenty years, this course had me examine my ethics practice in an engaging way and explore some of the subtleties of dual relationships in a different light. Very straightforward ethics course and a great reminder as to how we should be acting. I thought I didn't need another ethics course, but this book was wonderful and gave me much great insight. Perfect text book! I would like to say that I have learned a great deal in reading the book "The Educated Heart". I now have a clearer and more detailed understanding of transference, counter transference. Well written and straight forward. Even thou I've been in practice for 14 years I found the information a very good refresher. I read this book years ago before I used it for CEU's and loved it! I teach at a massage school and encourage all the students to read this book and feel that it should be mandatory reading.